I stamped the bear on scraps of paper from Crate Paper's Fourteen 6 x 6 pad. The background papers are also in that pad. I adore it. I loved making this card. I love SSS stamps. That is the cutest little bear - I totally want that set!! Adorable card!! He really needs to come live with me....and he can bring his friends, lol. Gorgeous little card, Lucy...great job! Just adorable ,love the bears. Adorable bears with the cutest sparkly noses! Fantastic cuteness - that is a lot of bears to cut out!!!! OMGosh! What an adorable bear! Love, love, love your card. Clever idea! Great for a little kids card! This gives me an idea to use another bear stamp i have. TFS! There are all some seriously awesome cards! 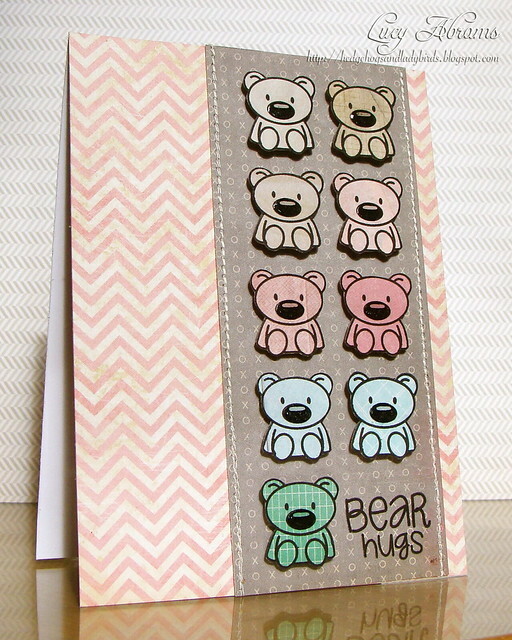 I love how you used the inside of the card as part of the design, and have those little critters peeking through! Those bears on those scraps of paper are awesome. Love how they have pattern and texture, without being overwhelming. This is such a cute card. 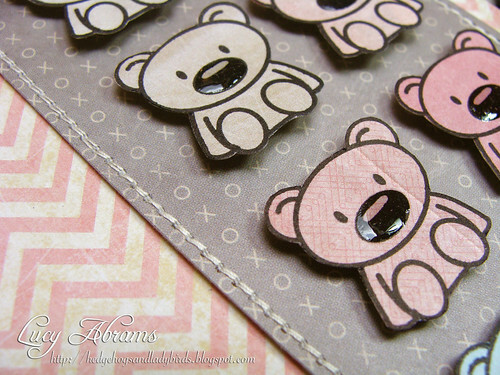 I love how you have used patterned papers for the little bears..
Simon Says Stamp Blog Hop!